With another look at one of the Brasileirão’s bright young prospects I am delighted to welcome another guest author. This time it’s Gordon Fleetwood, a Santista living in New York City, running the rule over their outstanding young goalkeeper Rafael Cabral. When it comes to outstanding goalkeepers in the history of Santos, a few come to mind. Without a doubt, the first is Gilmar of the magnificent team from the 1960’s. Another is the Uruguayan Roldolfo Rodríguez, who became an idol at the club during his spell in the 1980’s. The third name is Fábio Costa who was an ever present part of the club during the last decade, and currently holds the record for the longest time gone without conceding in Santos’ history. If all goes well, another name will be joining the list soon enough. In fact, one could argue that Rafael Cabral has already earned his place. In light of all that the young goalkeeper has already accomplished, it’s strange to think that his career could have been cut short. This was certainly a possibility after he broke his leg in a training accident in 2009. Thankfully, Rafael’s rehabilitation went well and he fully recovered from the injury. After making his full debut in the middle of 2010, the Santos youth product established himself as the number one goalkeeper at the club and hasn’t looked back since. As a first full year as a starter goes, 2011 must have been a dream come true for the twenty-one year old. He was an instrumental part of the team that won both the Campeonato Paulista and the Copa Libertadores. In the latter competition, Rafael’s dazzling performance against Club América in the second leg of the first knockout stage was a major highlight. 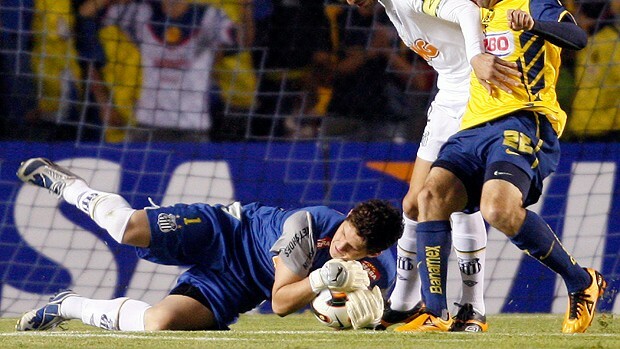 That night, he single-handedly kept Santos in the tournament with a string of spectacular saves. On the way to becoming the youngest goalkeeper to win South America’s premier club competition, Rafael came very close to breaking Fábio Costa’s aforementioned clean sheet record. Eventually, his good form earned him a call-up to the Brazil squad for the Copa Roca. The custodian also shined in Santos’ disappointing Brasileirão campaign. With the exception of a slight dip in form during the midpoint of the league season, he was superb. In fact, taking the whole year into consideration, Rafael was probably the third best player for Santos in 2011, only beaten out by the striking duo of Neymar and Borges. Not bad for a rookie goalkeeper. What most stands out about Rafael though is his mentality. A line is often drawn between goalkeepers who only shine when they are being constantly bombarding with shots, and those who are able to perform even after long periods of inactivity. During his short career so far, Rafael has excelled in both situations. He was good as a pure shot stopper in late 2010 when Santos’ defense was comparable to a drainer, and he was just as good when the defense improved considerably in the first part of 2011. In the modern age of football, Rafael is part of a class of young goalkeepers who are counterexamples to the adage that true competence in the position only comes with age. He is already one of the best in Brazil, and, without a doubt, one of the best youngsters in the world between the sticks. What is the next move for the young goalkeeping prodigy? Well, he’s staying put for now. Interest from Italy was met with a statement of a desire to become a legend at Santos. Still, there is a feeling that he will eventually make the move to the Old World. On the international stage, the youngster is the leading contender to be Brazil’s starting goalkeeper in next year’s London Olympics. If Rafael continues along his current trajectory, then he will be challenging for the number one jersey in the senior squad very soon. To read more of Gordon’s work, check out his brand new blog Santos FC Musings, or follow him on Twitter. You may have been wondering why the site hasn’t been updated over the past few days, and do not worry, I haven’t given up on it! On Friday I was composing my fortnightly column for the Mirror Football website (which you should totally check out by the way…), and over the weekend I was helping a friend by writing some betting previews for this weekend’s Brasileirão matches. So, Game of the Week should be back tomorrow, and on Friday/over the weekend there should be something else going up, whether that be another Twenty to Watch player profile or something different entirely. Which reminds me, if anyone is still interested in getting involved and submitting one of these profiles, you are most welcome to do so and you should check out this post here. Posted on October 18, 2011 Categories UncategorizedTags Game of the Week, Twenty To WatchLeave a comment on Inactivity? Never! Twenty To Watch: Get involved! With the relative success of my new Game of the Week feature, I’ll be introducing something new here on I Like Football Me, it’s called Twenty To Watch and there’s a great opportunity for you to get involved. The idea is straightforward, and I’ve been asked to do this plenty times. Between now and the end of the Brasileirão season, I’ll be posting up 20 player profiles of 20 different players, one from each of the 20 different teams in the 2011 Brasileirão. Continue reading Twenty To Watch: Get involved! Posted on October 7, 2011 Categories UncategorizedTags Brasileirão, Brazil, Twenty To Watch2 Comments on Twenty To Watch: Get involved!